Although Panini has been largely out of the hockey card world for several years as Upper Deck holds the sole license for trading cards, 2016-17 Panini NHL Sticker Collection lives on as their low-end sticker offering for the pro league. With a total set of over 500 stickers, much of the National Hockey League is covered with multiple sticker options for each team. Collecting in its most basic form, the 2016-17 Panini NHL Sticker Collection checklist includes 503 stickers with top current players and rookies featured. Among these are 131 shiny foil subsets that act as the only real insert in the release. Good overall coverage is provided with 14 stickers for each team, four of which being the foil editions. The tried-and-true format follows the previous releases, so many collectors should have a clear idea of what to expect. 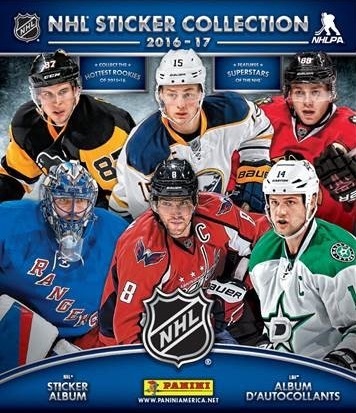 Acting as an accompanying piece, the 2016-17 Panini NHL Sticker Collection album offers 72 pages to store the set with two pages per team and additional album pages reserved for the 2016 Winter Classic, Stadium Series, All-Star Game, and Stanley Cup Playoffs and Final. The albums are normally found at retail in the same display box as the cards.